Is this the elusive Microsoft Lumia 850? In smartphone terms, it took Microsoft an age to deliver an updated flagship with specs to compete with high-end devices on Android and iOS. Fans of the Windows platform finally got their wish last year with the unveiling of the Lumia 950 and 950 XL. In the build up to their announcement, another handset -- known unofficially as the Lumia 850 a.k.a 'Honjo' -- was also being touted. Though said device is thought to have now been scrapped, some new images of an unreleased Microsoft smartphone have been leaked. With a slick, elegant overall design, it's a handset that many will hope still sees the light of day. Where Google and Apple have battled fiercely for supremacy in the mobile space, Microsoft has long been on the periphery. Redmond's Lumia range has focused its attention almost squarely onto the mid-range crowd, which has in turn forced those seeking a powerful experience to look elsewhere. Although the leaked snaps of the purported Lumia 850 likely offer a glimpse of what might have been, there's always a chance that Microsoft will release it to market. 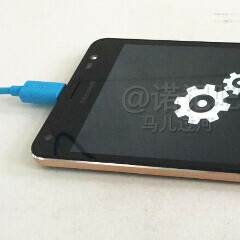 Shared by nokibar, the device is said to host a sizable 5.4-inch display, along with an iris scanner. As can be seen from the images, there's a micro USB slot, meaning no Continuum support, along with space for two SIM cards and microSD expansion. The black device appears to be comprised of glass or the trademark glossy Lumia polycarbonate, with a rose gold-looking metallic trim around the edge. Take a look, and let us know if you'd be interested in a device like this via the comments. Nexus 5x, is that you? Nexus 5X looks like a fusion between Lumia 925 and 640! And both of these are older than 5X! Why speak without knowing anything? soo many buthurt Lumia people...ok I give, frankly..I don`t really care for old Nokias but hey. Knowing microsoft, it will use a snapdragon 410 or 615, which will spoil the rest of amazing hardware. Actually it might use the SD 617 that supports Continuum. Looks really old !!!! Like a 5 years old Iphone! Sad sad sad phone! Its windows phone! no dedicated cam button, but a handsome looking phone and certainly a leap ahead of the 950's in aesthetics. No it doesn't, not even remotely. Every car on the road must all look the same to you because they have 4 wheels and windshields. I use a Nokia lumia 928 this smart phone is little nicer looking than mine however if it does not have "Continuum" mode it's an ARMS CPU smart phone depending upon Developers making MS Universal apps that will work on it. since Windows smart phones are a Minority seller there is worry developers will make apps ARM's CPU Windows smart phones can use. hopefully Microsoft will get developers to make Universal apps so Windows smartphones can use them. For me it looks like Lumia 650 because of missing camera button, dual sim and micro USB. Lumia 8xx always was very similar to a flagship 9xx with a little bit lower hardware specifications.